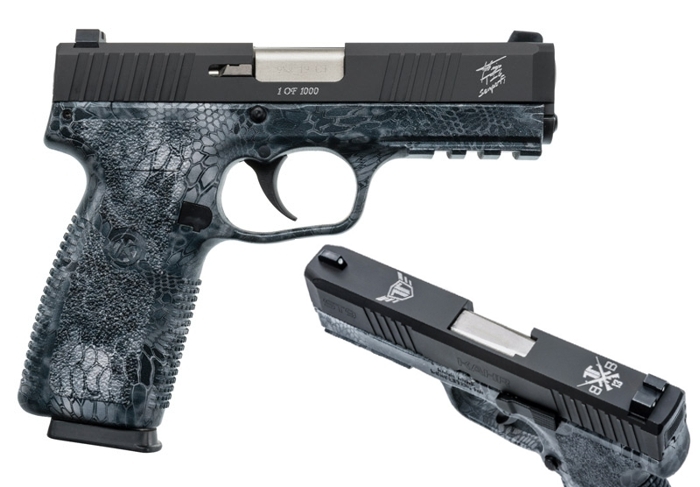 Kahr Arms TIG series ST9 pistol is a 9mm sub-compact pistol with 4” barrel featuring Kryptek Typhon print on the polymer frame with accessory rail, a blackened stainless steel slide, front slide serrations, and white three-dot sights. It ships with two eight-round magazines. Engravings on each pistol will include its number in the series, the TIG logo, TIG’s signature and the Beyond the Battlefield logo. John “TIG” Tiegen is co-author of 13 Hours: The Inside Account of What Really Happened in Benghazi, American hero, former GRS Operator and survivor of the attacks. Part of the proceeds from the sale of each firearm will be donated to the Beyond the Battlefield (BTB) Foundation by Kahr Firearms Group, the parent company of Kahr Arms. Beyond the Battlefield is a non-profit 501(c)(3) organization that John “TIG” Tiegen and his wife, Margaret, founded in 2017. Its mission is to provide support for wounded veterans as they face the many challenges encountered during rehabilitation, the healing process and reintegration into everyday life. Kahr’s parent company, established in 1981, has been a leading supplier of computer numerical control (CNC) machine tools and applications engineering. In 1986, the company expanded by forming a manufacturing division which provides quality contract machining, manufacturing and assembly services for diverse industries, including aerospace, automotive, electronics, medical equipment, scientific instrumentation and telecommunications. This division offers in-house engineering and precision tooling services, as well as, secondary operations that complement the machining and manufacturing capabilities.